Description 1976 - 1977? Includes negatives. 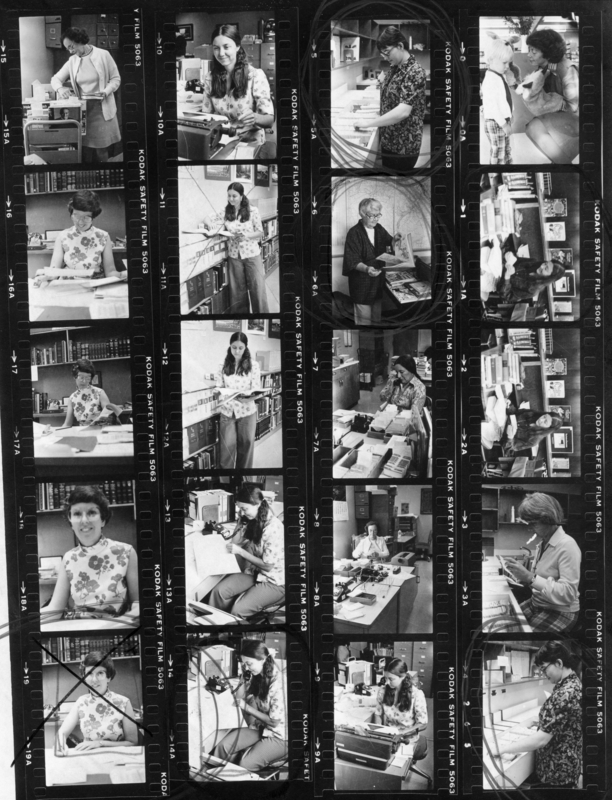 Left row, top: Marge Minor, clerk; bottom: Carol Hildebrand,library director. 2nd row: Claire Kellogg, reference librarian. Row 3, top: Lois Sparks, clerk; below: 6 Fran Lain. 7 Hazel Skelton. 8 Marge Minor, 9 Claire Kellogg. 4th row: 0 Mary Norman, children's librarian, 1-2 Beth Daugherty, clerk, 3 Sue Burgess, clerk, 5 Lois Sparks, clerk.